"A great resource for educators who want to strengthen their connections with students, teachers, parents, and the wider community. These two innovative leaders don't just capture how to tell the story of a school--they show how to create it." "Every day in every one of your schools, great things happen. How does your community know? Schools that are Future Ready boldly engage their community to build relationships and empower both students and families. Powerful yet practical, BrandED is the perfect resource to help your school share its story with the world." 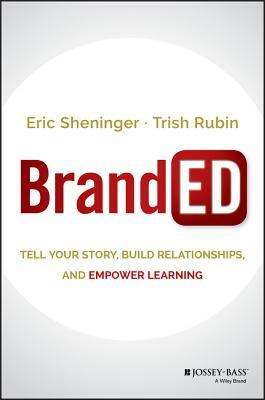 "Eric and Trish demystify what it means to brand one's school by providing eight compelling conversations that not only lead to a deeper understanding of branding, but provide relevant ways for school leaders to frame their work... . In the vast sea of information in which we currently reside, using the BrandED Leadership methods described in this book will help school leaders reach their audiences in ways that create trusting relationships and loyalty." "Disruption is the new normal. And the great disruptors of our time are shaping the culture itself in innovative ways. Eric and Trish's book BrandED sends a very compelling message to school leaders that developing and executing a smart, innovative brand strategy can disrupt the best practices' conventions of the existing school system. Like great disruptive brands from Apple to Uber, educators now have the ability to get the community engaged and immersed in the school's brand equity--and BrandED provides the roadmap for getting there." --Scott Kerr, Executive Director of Strategy and Insights, Time Inc.
A brand is built around three key elements: image, promise, and result. The power of a brand to communicate all three elements is undeniable, and in today's digitally connected, social society, schools and school districts have a lot to gain by developing and promoting their own brand identities. BrandED is the groundbreaking guidebook for educators who want to enhance communication with students, parents, and stakeholders to create a transparent record of value. BrandED is your one-stop resource for designing and sustaining your individual brand as a leader and the brand of your school or district. Join the conversation on Twitter using #brandEDU. ERIC SHENINGER (@E Sheninger) is a senior fellow and thought leader on Digital Leadership with the International Center for Leadership in Education (ICLE). An award-winning principal, he is the creator of the Pillars of Digital Leadership, a framework for transforming school cultures through sustainable change. TRISH RUBIN (@trishrubin) consults with clients in education, business, and the nonprofit sector to build brand awareness, market services and products, develop visibility through PR and media, and build strategic partnerships.